The theme for the first year of the Emory Integrity Project will be "Standing." At the Jan. 27 launch reception, Center for Ethics Director Paul Root Wolpe displayed a word cloud illustrating different aspects of the theme. 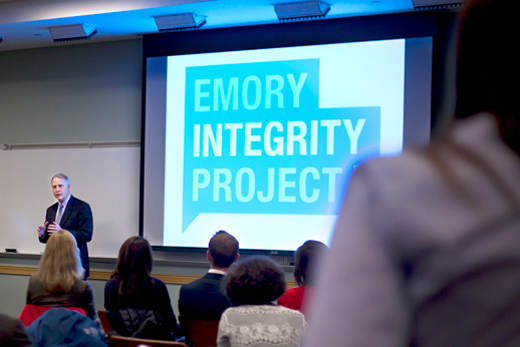 The Emory Integrity Project reception included the screening of a short film made by students exploring what integrity means and what a culture of integrity at Emory would look like. As part of the Emory Integrity Project, every incoming student will receive a copy of "I am Malala" over the summer before arriving at Emory. "I Am Malala," the memoir of a young woman shot by the Taliban for speaking out for her right to education, will be read by all incoming first-year students as the Emory Integrity Project explores the theme of "Standing" for its inaugural year. The Emory Integrity Project (EIP) is seeded by a $2.6 million grant from the John Templeton Foundation and described as a comprehensive effort to promote and develop a culture of ethics and integrity throughout Emory's undergraduate experience. Each year, the project will address a theme related to some aspect of ethics and integrity, reflected in a new common reading program. The EIP unveiled its 2016-17 theme and the book selected for students Wednesday, Jan. 27, at a reception at the Center for Ethics. Led by Center for Ethics Director Paul Root Wolpe, the EIP is a joint project of the center and the Division of Campus Life. Wolpe heads the EIP’s faculty advisory project, and Emily Lorino directs the student advisory committee. 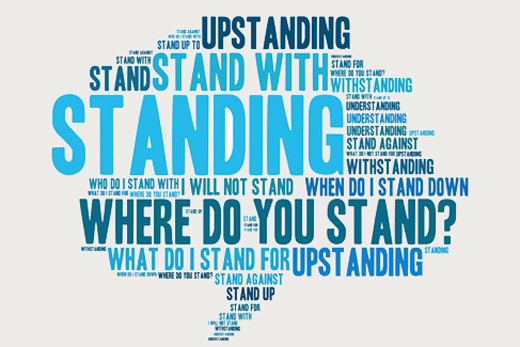 The theme of "Standing" encompasses "all of its associated ideas and terms — standing for, standing with, standing against, outstanding, upstanding, withstanding, what do you stand for, what don’t you stand for,” explained Wolpe, telling the audience that the theme was suggested by Charles Howard Candler Professor of Psychology Marshall Duke. “It allows us to talk about a variety of different kinds of ways in which people stand up for things," Wolpe said. "It also allows us to have a conversation about the metaphor of standing, which is an ableist metaphor, so it brings in the question of why it is we tend to use ableist metaphors for those kinds of things. “So there are some really interesting ways we can use this word to explore many, many different areas of ethics and integrity," he said. 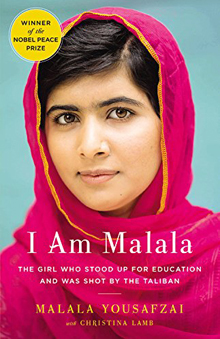 EIP faculty and student advisory committees selected “I Am Malala” as the common reading for the project's first year. Malala Yousafzai, a student in Pakistan, dared to speak out for her right to an education and was shot by the Taliban at 15 as she rode a bus home from school. She survived and continued to speak out for girls' education, becoming the youngest winner of the Nobel Peace Prize. Every incoming student will receive a copy of the book over the summer before arriving at Emory and it will serve as the basis for a year-long series of discussions related to the theme of "Standing." “We hope to get lots of other students to read it, too. We hope to encourage faculty to include this book in their syllabi, in courses, where it’s appropriate and relevant. And we’re going to foster conversations about this book as we go on, especially in Campus Life and the residence halls,” Wolpe told the reception audience. “Why this book? Because it allows such a broad array of kinds of conversations,” he said, ticking off some of the topics, including “adolescence, family, feminism, violence, geopolitics, immigration." Speaking at the EIP launch reception, Emory President James Wagner said the project came out of conversations that began in 2011, when Emory’s aspiration to be a more ethically engaged community came to the attention of an executive vice president of the Templeton Foundation. Provost Claire Sterk also spoke at the event, joining Wagner in praising the project. “I like that you are calling it the Emory Integrity Project because I think there is something really special about having the words ‘Emory’ and ‘integrity’ together in a sentence. I want to thank President Wagner,” Sterk said. Wolpe noted that the Templeton Foundation gives three-year grants, and Wagner provided funding to extend the Emory Integrity Project to span five years. “It is because of that funding from the University that we could spend an entire year planning this, so that when it officially begins in September, we will have had an intensive year getting everything ready," Wolpe said. "It is going to … penetrate much deeper into the University because we had that year of work ahead of time." Wolpe also noted that a student committee is suggesting strategies for the EIP's implementation and introduced a short film created by student Megan Freeman. The film shows a variety of students explaining what integrity means and what a culture of integrity at Emory would look like, both through interviews and in phrases written on white boards. “I think it’s a wonderful basis for us to build on,” Wolpe said of the film. Robin Forman, dean of Emory College of Arts and Sciences, noted after the reception that the Emory Integrity Project dovetails well with the goals of undergraduate education. "The faculty of Emory College are committed to providing a deeply engaging educational experience, and are extraordinarily creative in the ways that they turn every course into a true intellectual journey," Forman said. "I look forward to watching how they will respond to this new opportunity to introduce fundamental and challenging issues into their curricular and co-curricular offerings."